I believe these trays by Giftco are from the 1980s or 1990s and are in the style and spirit of the light weight metal trays that were ubiquitous in the mid century era and a source of fun collecting in later decades. The Snoopy design on these trays is copyrighted by United Feature Syndicate, Inc. 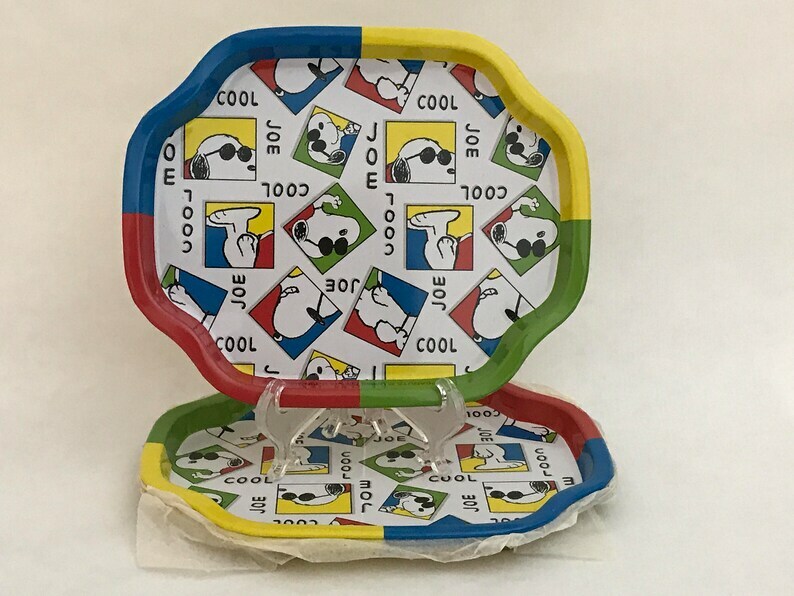 In my opinion these trays with their unique shape, small size, and whimsical images of Snoopy from Peanuts comic fame dressed in his Joe Cool look make particularly fun collectibles. Each tray is approx. 6" x 7 1/2". Some people refer to these as tip trays in memory of when these type trays might be used by a waitress to deliver your check and collect payment. This group of 3 are in excellent condition. One tray still has the tissue on top that it was probably delivered to the store in, and the others look unused. Arrived safely and is exactly as it's shown in the picture.